Series Wiring links your speakers together Positive terminal to Negative terminal and the resistances of all the speakers are added together. Series Wiring INCREASES impedance. The mulitplier is the number of speakers and the starting nominal impedance. In other words, two 8 ohm speakers wired in series have an 16 ohm load MOL. Three speakers have a 24 ohm load, etc. 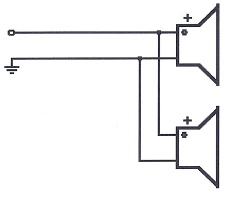 (Series = Sum) This allows the amplifier to be more efficient and to run cooler but series wiring does increase the resistance that the amplifier sees. The amp does not put out less power as is commonly believed. The power output remains the same, but it can appear to be less because each speaker is only receiving a portion of the overall power. Parallel Wiring combines all positive leads together and all negative leads together. This reduces impedance and lowers the amp draw. 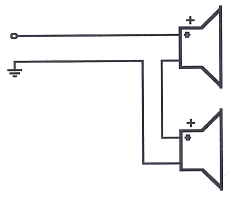 Two 8 ohm speakers wired in parallel have a 4 ohm load MOL. It is important to know the parameters of the amplifier. Lowering the impedance beyond the recommended range can damage the amplifier.